Some of the world’s graveyards offer scenic vistas and are tourist attractions. 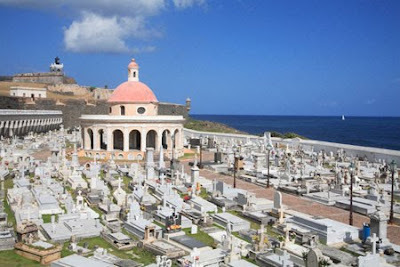 San Juan Cemetery in Puerto Rico is located next to El Morro Fort and overlooks the Atlantic Ocean. Poets, politicians and composers have been laid to rest here. 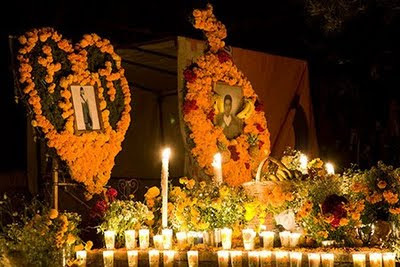 The overnight candlelight vigils in cemeteries for the Day of the Dead held in Mexico every November are far from spooky and an experience not to be missed if you have the chance. 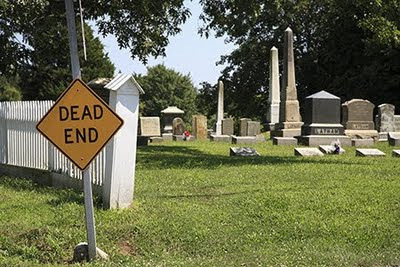 But it might be a good idea to heed this sign outside a graveyard located in a hamlet a few hours outside of New York City if you have plans to keep on moving. You should see the Chinese Cemetery in Manila! Talk about lavishness! They have mansion mausoleums, many have air-conditioned rooms, complete with washrooms and mini-kitchenettes and spare "bedrooms". Turkish graves are also very elaborate. Large marble raised graves with a patch of dirt on top to grow flowers. I haven't been to many graveyards, but I'd love to visit Pere Lachaise in Paris. Graveyards are such interesting places, wherever you go. I don't think I've ever found a boring graveyard.